Guard Towers, Dachau, originally uploaded by Eric Jeschke. 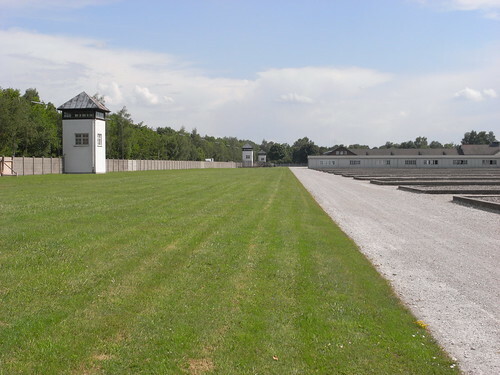 Guard towers were placed around the perimeter of the compound, and there was a sizable buffer area between the dozens of barracks buildings and the fence. Even if you could make it to the fence, and over the tall razor wire, there was ample opportunity to be picked off by a marksman in any of the towers. According to the accounts there, prisoners would sometimes rush the fence just to be shot and leave the agony of the camp behind. There were only a couple of successful escapes.